But Peter doesn't kiss me, not the way I expect. He kisses me on my left cheek, and then my right; his breath is warm. And then nothing. My eyes fly open. Is this a literal kiss-off? Why isn't he kissing me properly? "What are you doing?" I whisper. I still find it very surprising, having a boy in my personal space. I still get nervous when he puts his arm around my waist or reaches for my hand. I don't think I know how to date in the 2010s. I'm confused by it. I don't want what Margot and Josh had, or Peter and Genevieve. I want something different. I guess you could call me a late bloomer, but that implies that we're all on some predetermined blooming schedule, that there's a right or a wrong way to be sixteen and in love with a boy. His words sting just the way he intends them to. "I hate that saying. What does it even mean? Of course I want to have my cake and it it too - otherwise what's the point of having cake?" I simply adored To All The Boys I've Loved Before so when Jenny announced she decided to write a sequel titled P.S. I Still Love You, I was thrilled! More Lara Jean, more Peter, more Kitty, more! And now that I've read it? Don't get me wrong, Jenny's writing and story telling aren't suffering. They're not the issue. Jenny is a superb writer and her scenes and characters were spot on. She does an amazing job of showing her readers what is happening and inserting us into the story. Her characters read like sixteen/seventeen year olds, or a rather mature ten year old in the case of Kitty, and all have separate personalities giving P.S. I Still Love You that spark of realism that is needed in any piece of literature. My issue, and given it's 4.2 Goodreads rating this is my issue, is that after reading P.S. I Still Love You I don't know know if it was necessarily needed. I love the ambiguous ending of To All the Boys I've Loved Before and while I craved this sequel, my feelings toward it are tempered. Lara Jean did experience growth, and I loved the addition of John Ambrose McClaren, but the love triangle?! No. It didn't do it for me and Lord knows I love me a good love triangle. I can understand the stupid arguments between Lara Jean and Peter (what high school students don't have stupid arguments?) but it didn't feel like anything was really solved. More like, pushed into the dark recesses of the basement closet underneath that old rug. They're gonna creep back up, kids! There did seem to be a high level of unnecessary drama, but then again these are high school students and aren't their lives fraught with unnecessary drama? 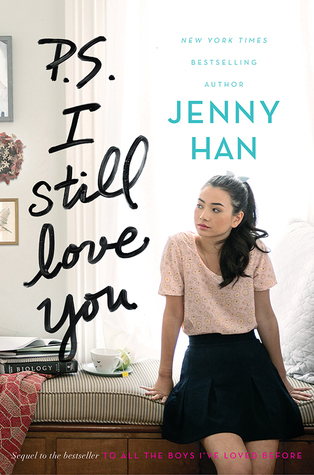 If you are a fan of Jenny Han and Lara Jean, I do think you should read P.S. I Still Love You, especially if the ending of To All the Boys I've Loved Before caused you to curse the heavens. However, if you thought it ended perfectly and are content with "Dear Peter," then maybe skip this sequel and lose yourself in Han's Summer series.